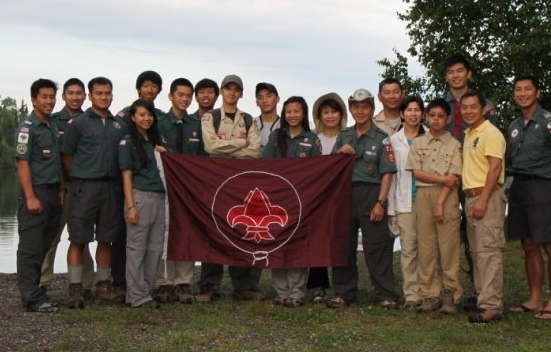 We had two groups of California Scouts last summer—led by Hung and Tuan Le (all photos courtesy of Hung Le). 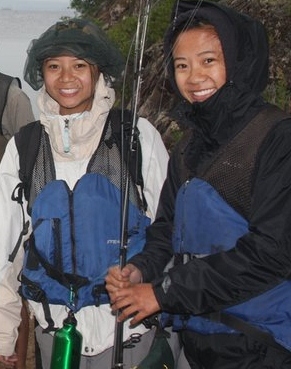 They portaged from Seagull to Grandpa to Roy to Sag (and that is something) ….and on to complete a couple of high adventure trips that they had been preparing for all winter. I met Hung and Tuan when I was 11 years old. In April, 1975, their family of 15 scattered, and some fled their home in Da Lat. I don’t know all the details. Saigon fell, their father, a local judge, was jailed by the North Vietnamese. Hung picked up Tuan from highschool, on a motorcycle and they made it out of the country by boat, and their older brother Cuong escaped by plane. They never got to say goodbye to their parents or their siblings. I remember they felt badly about that. In the chaos of that day they never got to say goodbye. 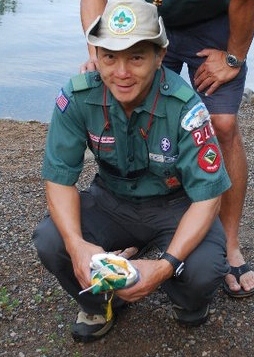 Hung, Tuan, and Cuong later met up in a refugee camp in Guam. Our Minneapolis church sponsored them, and they came to our house for awhile. Lots of things didn’t occur to me then. When my parents moved all four of us kids out of the upstairs, it wasn’t just hospitality space for the brothers. It was possible that we had just invited creepy strange men into our home. Isn’t that life? Take a chance on potential creepy strangers, and you might end up extending your family by 3 good people-and eventually, by proxy, a very large Vietnamese family. We hit the jackpot. It also never occurred to me that they were always prepared with emergency rations and an escape plan, in case they were placed with creepy strangers—or that the evil smiling family (us) were in fact taking them to some sort of internment labor camp in the wilds of northern Minnesota. I was 11, and I had never lived in a war. I still can’t quite fathom why anyone would want to memorize all of the aircraft carriers and destroyers in our navy….and who knows what else about the defense system. Hung once told me he couldn’t imagine not knowing. A war-zone mindset? Is this why he speaks English, Vietnamese, French, Spanish, Russian, and some Chinese? I have no interest in keeping track of the US submarines, because really I have enough trouble keeping track of my black socks. But also, what are the odds of Duluth falling (as Saigon fell?). Nope, just not in the war-zone mindset. 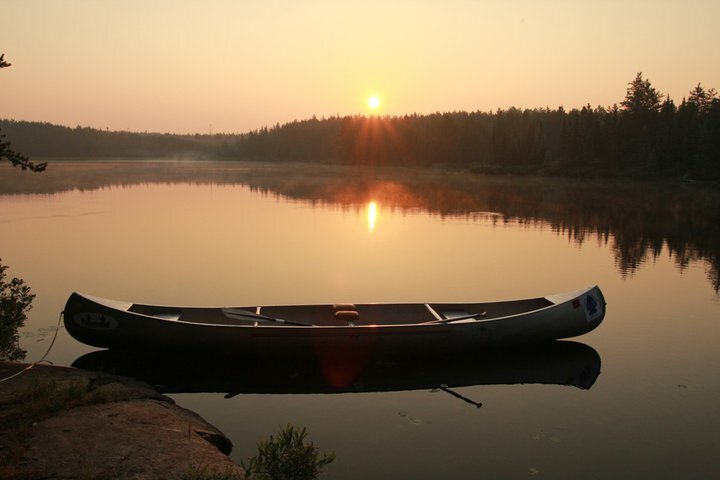 Back to that first summer–the 3 brothers lived on Seagull Lake where they worked for Wilderness Canoe Base, and for the US Forest Service. After they realized that they didn’t need to escape through barbed wire into a jungle full of tigers, they could relax and leave their backpacks full of survival gear, and soak up the people and the place. 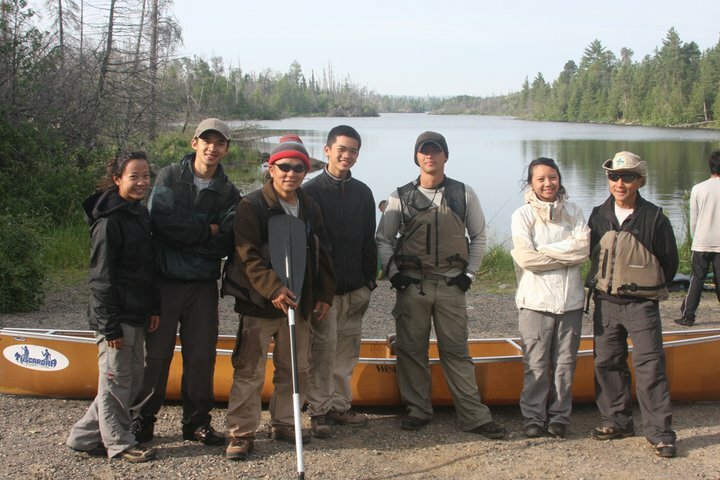 They were welcomed, and found a home in the Boundary Waters. They have always been resourceful and self-sufficient, more than anyone I know. Their shrewd pride enabled them to smuggle all their family members out during the volatile years in Vietnam, and more recently to travel to start orphanages inside Vietnam. 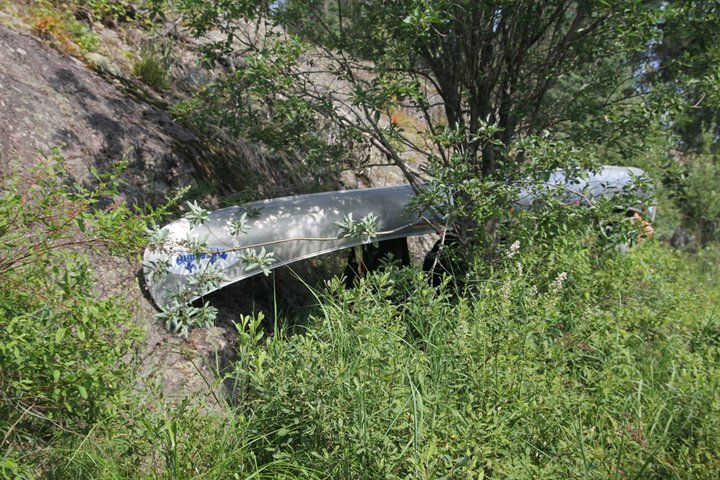 This summer, we transported the scouts to the Wilderness Canoe Base parking lot so they could visit before they launched onto Seagull. As Tuan and I walked ahead of the group to the main office in the cove, he was reminiscing, and got a little misty with his story, and for a minute I had a glimpse of him, a very brave and sweet young man— Shelby’s age—walking down that driveway 35 years ago. But also, I had a flash of empathy for Tuan’s mom. It’s the first time I’d ever considered the story from her angle. I know how terrifying and touching it is to send your kids out into any new situation—but to send your sons out into the enemies, while your husband was in jail —well, it must have been a low point. I could feel her anguish. What choice did she have but to have faith in their ingenuity and intelligence? She was a mom in a war zone, but I’ll bet she still had to get up and put her shoes on, sweep the floor, take care of the kids, prepare the food. In the end, everyday life is just what a person does. Maybe she just had to trust that it was going to be OK, and that her kids would be OK too. 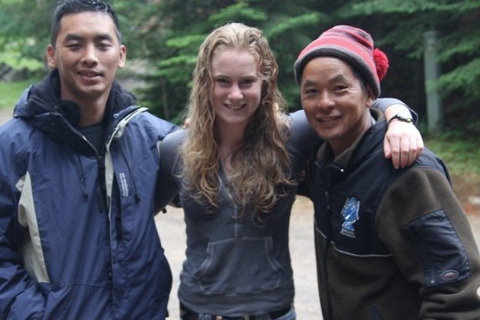 Turns out they landed in one of the most enchanted places on earth, and Tuan’s heart began to heal here. Could she have dreamed of the life he would lead, that she’d live in his Californianeighborhood, that he’d be back to the woods when his his capable teenage daughters were about his same age? Could she have imagined this 50 year old Tuan with the same witty twinkle in his eyes? These thoughts rushed through my own (mother’s) heart as I we walked on. 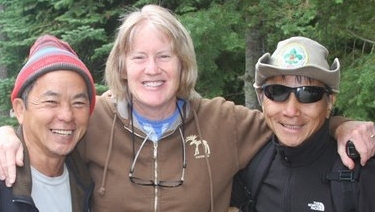 Thirty five years ago, Tuan and I couldn’t have known that our lives would intersect at Seagull Lake, or that we would share the sacredness, the peace, the transformational effect that the BWCAW and the people of Wilderness Canoe Base had on both of us. He smiled at me with eyes brimmed with tears, and I swallowed the lump in my own throat and smiled back. And we walked into the cove, and looked across to Dominion Island where we could see the ribs of the chapel, and the sparkles of the sun on the water. He had grown up, and I had grown up. We both had children, and even they were almost grown up. And just like that, the nostalgic moment was over. He was ready to lead his group, and I had to return to Tuscarora and get back to work. In the end, everyday life is just what a person does. This is beautiful, Sue. I had heard stories about these brothers–I didn’t know they were still coming up to Seagull! Thank you for sharing this and giving me another picture. Nicely done, Sue. Thanks for remembering and sharing those days. It brings back many memories of time with the brothers. 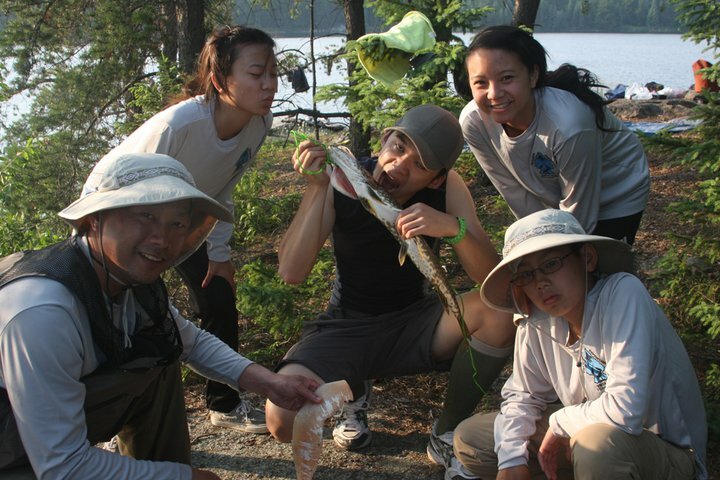 It was a joy to be able to have dinner with them and their scout troup at the end of the canoe trip this past summer.